Classic pickup trucks are coming into their own as recent high profile auctions show. 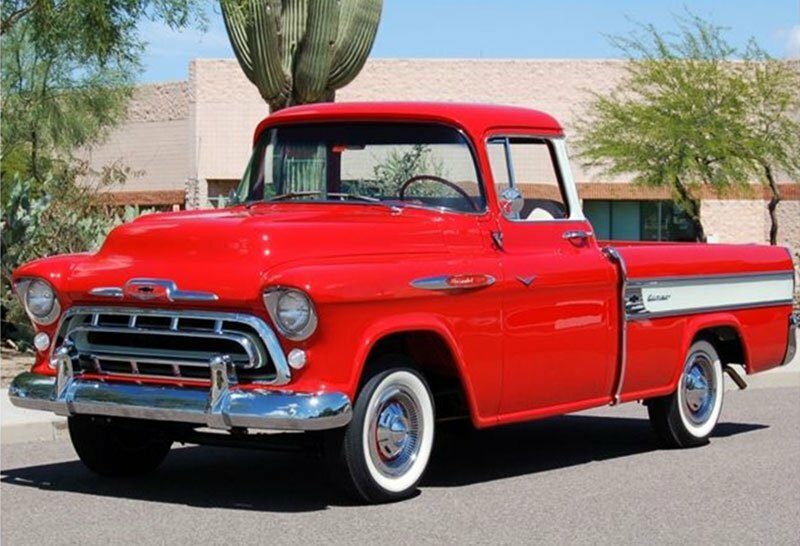 Here is a 1957 Chevrolet Cameo Carrier Pickup from Arizona Classics in Scottsdale. A very nice truck like this sold for $77,000 at the recent 2017 Barrett-Jackson Auction. In analyzing 2017 Barrett-Jackson Auction and Mecum Kissimmee Auction results, Cars On Line.com says average prices on collector cars remain the same as last year. The internet’s most popular collector car website sent teams to cover both auctions in January. The expectation of accelerating collector car values peaked the interest in these two high profile auctions. They are a barometer of collector car price trends for the coming spring market. But overall sales figures for both auctions were down slightly from last year. Here is what Cars On Line.com found in analyzing 2017 Barrett-Jackson Auction and Mecum Kissimmee Auction results (with average values from the two auctions shown in the “January” column.) The “2016” column shows prices as of the end of the year 2016. The “January” auctions column totals are down from the 2016 column totals by one percent. That wasn’t what collectors were expecting this year. Almost always a “body off” restoration, or an untouched, factory-perfect, piece that is very close to perfect. All components are either original or appear as new and are fully operational. This car is a top show winner and is not driven, but transported to shows by trailer. This car is almost “one of a kind”. This particular class of vehicle is very rare. The vehicle is completely detailed, including the engine compartment, interior trim, wiring, suspension, paint, and frame. Ideally, this vehicle has been judged with other vehicles in its class and achieved the highest point ratings. This type of car is a fun “driver” with a solid frame and is structurally sound. This car is in need of considerable work. It needs work in and out. Cosmetics, body, and mechanical components all need work, to some degree. It is not a serious collector candidate. Soft floors, isolated areas where rust has eaten through (but not structural), excessive use of Bondo, lots of pitted chrome, glass repairs are symptoms of this condition. Badly soiled headliners, badly soiled and ripped upholstery, rusted out trunks are also signs. This type of car is in need of complete restoration and may, or may not, be able to be driven. The exterior body panels have significant areas of rust-through. The floor and structural components may, or may not, be intact. This car is usually the first project for layman’s attempt at restoration. This type of car is good for parts only.